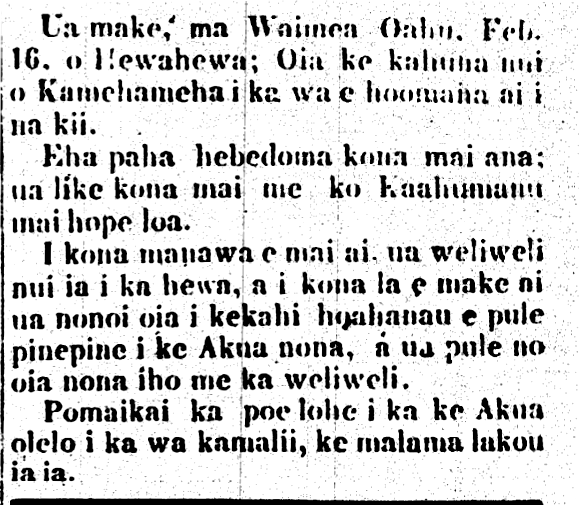 Speaking of Hewahewa, the great kahuna o Kamehameha…, 1837. Hewahewa died at Waimea, Oahu, Feb. 16; he was the great kahuna of Kamehameha during the time when the idols were worshiped. He was ill for perhaps four months; his illness was like that of Kaahumanu’s final illness. While he was sick, he was terrified of sins, and on the day that he died, he asked one of the brethren to pray often to God for him, and he prayed for himself in fear. Blessed are those who hear Godʻs teachings while they are young, should they heed them. Ke Kumu Hawaii, Buke 2, Pepa 24, Aoao 96. Aperila 26, 1937. Keau was the father, Kamohoula was the mother. From the two was born this child, Opukahaia, along with another younger child (the name of that child is not known). Opukahaia was born soon before the battle between Kamehameha and Namakeha at Kau. And at Kau in Ninole, is where Opukahaia was born. He was named for the slitting of the stomach of a certain alii, and that is why he was called Opukahaia [“the cutting of the stomach”]. When the time of warfare between Kamehameha and Namakeha arrived, the parents of Opukahaia were killed. When his parents were killed, Opukahaia fled Kau, and went to Kohala. While he lived in Kohala, Opukahaia was found by Pahua, the brother of his mother, and he was returned here to Kona, and lived with Puhua them and Hina them here in Napoopoo, South Kona, Hawaii. The time when Opukahaia was living here in Napoopoo, when he was brought back from Kohala, he was an adult at the time. While he lived here, to him belonged the occupation of the kahuna of the olden days. Opukahaia was obedient; he was however not a farmer nor a fisherman, for he was not taught much about those things. He really just wanted to be taught kahuna things, and this was something that he was very interested in doing constantly, on sacred nights of Prayer [? Hainapule]. The one who taught him the ways of the kahuna was Pahua. He was a skilled kahuna taught by Hewahewa, the Great Kahuna of the Heiau of Hikiau. After Opukahaia received the knowledge of the occupation of the kahuna, he constructed his stone Heiau within Helehelekalani, and he built a house atop his heiau, while he worshiped three gods. 1. Lono, 2. Kukaohiakala, 3. Kukailimoku. He was constantly honing his skills, until he left for America. When the American trading ship appeared here at Kealakekua, he was prodded by a haole aboard the ship, named Mika Alani, who was an aikane of Hewahewa; and so he went and left the work that he was trained in. And at this Heiau which he built, he planted three coconuts, and they are growing and fruiting. The cave [? pao] of this boy, Opukahaia, can be seen by those who visit here. His relative still lives here in South Kona, her name is Hina; she is gray-haired and is frail now. This is a short story of what is heard of Opukahaia. With mahalo. 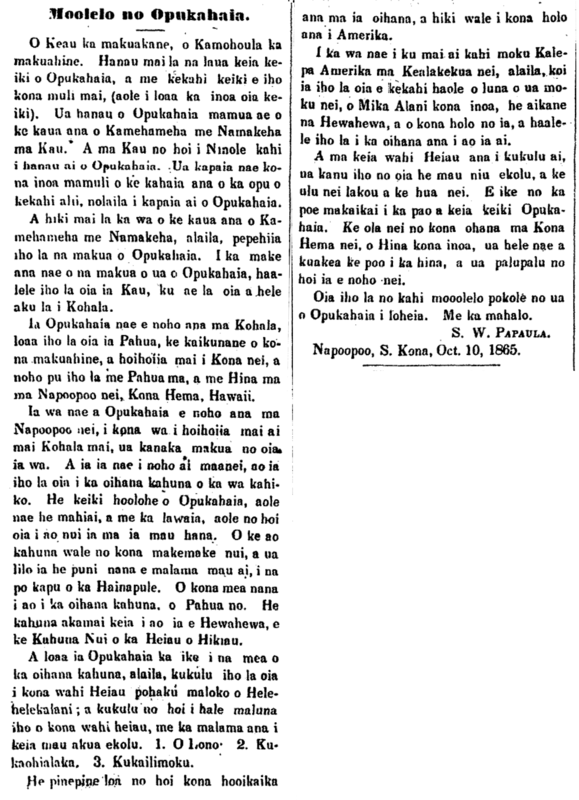 Napoopoo, S. Kona, Oct. 10, 1865. Ka Nupepa Kuokoa, Buke IV, Helu 44, Aoao 4. Novemaba 4, 1865.